I love seeing non-traditional sledding breeds! So many dogs love to do this! 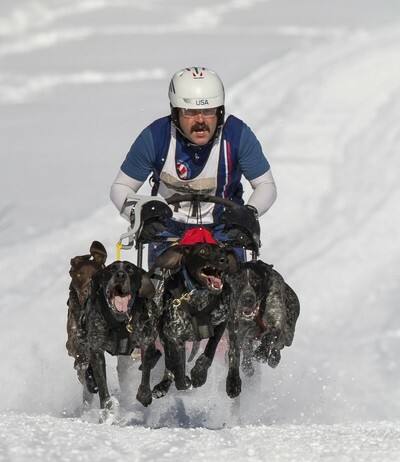 The Haliburton Sled dog Derby was held at the Pinestone Resort in Haliburton ,Ontario. I captured this image in the mid morning hours with a beautiful sun behind me. The clear skies gave me lots of light to up the shutter speeds to stop the action ,and the sun being behind and still fairly low helped a lot to keep the shadows from being to harsh. I used my trusty Canon 7D camera ,Canon 500mm f4 telephoto supported with a Gitzo carbon fibre tripod and topped off with a Wimberley MkII panning head. I enjoy taking photos of dogs in action ,and sitting out on a winters day capturing sled dogs racing is awesome ,the variety of breeds racing and the constant action is great to watch and to capture in a photo . Processing was fairly simple the usual cropping ,tone ,light and sharpening adjustments. I Carry a Canon 7D camera ,Canon 500 mm f4 telephoto ,a Canon 1.4 converter ,Canon 70-200mm f2.8 , pack loads of memory cards . I also use a sled to tow my equipment out into the field away from the crowds which I load with a second pair of snow shoes (trails are packed snow, I use small snow shoes ,off trail is deep soft snow I use big snow shoes) also in the sled is warmer clothing for sitting out in the cold for hours ,hot shots for hands and feet ,a lunch and plenty of water and a low stool to sit on. The action if fast and furious ,no patience required ! Pick a spot that has the light and ground that works for you ,this shot was taken at the bottom of a hill( gave me an non distracting background) ,I had positioned myself on a bend in the trail so I could get the head-on shot and there was a small rise at the bottom of the hill which was perfect for capturing the teams as they came over it . When I shoot the action I use high burst mode on the camera and have the focusing constantly tracking the lead dogs . I set the focusing point low in the viewfinder to stay on the dogs not the musher. I usually hold down the shutter for as long as the camera buffer will take it to try to capture an image were all the dogs are visible in one image ,you will be surprised at how many shots where you miss one or more dogs as they bound along. When I have located a good shooting spot out on the trail I dig a hole in the snow and set up in the hole to give me the low position with the camera to look the dogs right in the face.